CLOSE TO STATION & TOWN: A modern, well-planned, second floor apartment situated within walking distance of Ipswich town centre and mainline railway station.The property offers well-proportioned accommodation, including an entrance hall; two good-size bedrooms; an en-suite shower to the main bedroom; a lounge/diner with balcony overlooking the river; a fitted kitchen; bathroom/WC; gas to radiator heating; and an allocated parking space. Ipswich is the county town of Suffolk and provides a comprehensive range of educational, commercial and recreational facilities, and an excellent link to London's Liverpool Street Railway Station (about 70 minutes). The town has two shopping malls; shops; restaurants; bars; a multi-screen cinema; music; entertainment venues, and many sports clubs and societies. The waterfront docks has an ongoing regeneration project providing an excellent marina, recently built high-tech University and college, restaurants and bars. Staircase leading up to the second floor landing. Smooth ceiling, wall-mounted thermostat. Entry phone. Smooth ceiling, radiator. Double glazed sliding patio door to balcony area with views over the river. Smooth ceiling, double glazed window to front elevation. One and a quarter bowl stainless steel single drainer sink unit with mixer tap and cupboard under. A range of floor standing cupboards, drawers and units with adjacent work surfaces and tiled splashbacks. Wall-mounted matching units. Filter hood over four ring hob with electric oven under, integrated washing machine, space for fridge/freezer. Radiator, wall-mounted gas-fired boiler. Extractor fan, smooth ceiling. Low-level WC with concealed cistern, wash hand basin with mixer tap, panelled bath with hand grips and mixer tap. Shower unit over bath area with screen, and tiled splashbacks. Built-in storage cupboard. Radiator. Smooth ceiling, extractor fan, low-level WC, wash hand basin with mixer tap and tiled splashback, shower cubicle and shower unit, screen door and tiled splashbacks. Smooth ceiling. Double glazed window to rear elevation. There are communal areas with views over the river and one allocated parking space. Disclaimer - Property reference 2478017. The information displayed about this property comprises a property advertisement. Rightmove.co.uk makes no warranty as to the accuracy or completeness of the advertisement or any linked or associated information, and Rightmove has no control over the content. This property advertisement does not constitute property particulars. 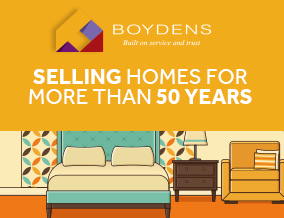 The information is provided and maintained by Boydens, Colchester. Please contact the selling agent or developer directly to obtain any information which may be available under the terms of The Energy Performance of Buildings (Certificates and Inspections) (England and Wales) Regulations 2007 or the Home Report if in relation to a residential property in Scotland.